ARMATS Biotek Training and Research Institute, Chennai – 6000 032, Tamil Nadu, INDIA. Department of Biotechnology, Vel Tech High Tech Dr.Rangarajan Dr.Sakunthala Engineering College, Chennai – 600 062, Tamilnadu, INDIA. The aim of the study was to investigate phytochemical constituents, free radical scavenging activities and antimicrobial activities of the aqueous extract of tubers of Drynaria quercifolia. The qualitative and quantitative analyses were carried out for the aqueous extract using standard procedures. The antioxidant activities were carried out by DPPH free radical, ABTS•+ radical cation, OH• radical, NO• radical scavenging assays as well as Fe3+ reducing power and phosphomolybdenum reduction assays. 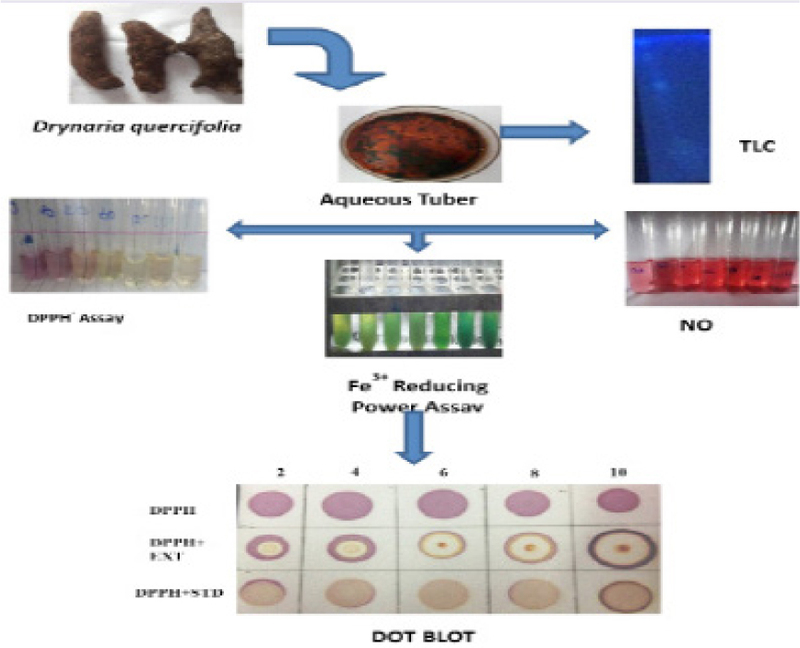 The tubers of D. quercifolia in aqueous extract showed good radical scavenging as well as reducing power activities. The major phytochemicals such as phenols and flavonoids were estimated as 4.29±1.23 and 24.56±0.86 μg/mL respectively. The aqueous extract of tubers of D. quercifolia possesses significant antioxidant activities. The dried tubers were cut into small pieces and extracted with hot distilled water using a pressure cookware. The hot aqueous extract was cooled and filtered using filter paper. Water was completely removed at 50°C hot plate apparatus. Finally brown gummy residue was obtained and was used for antioxidant activities as well as thin layer chromatographic (TLC) analysis. Folin-Ciocalteau reagent method was used to estimate total phenolic compounds (Spanos, and Wrosltad, 1990) with slight modifications. One mL of methanol extract (1mg/mL) of aerial parts of C. viscosa was mixed with 1 mL of Folin Ciocalteau reagent (1:10 diluted with distilled water). After 5 min, 1 mL of aqueous solution of Na2CO3 (20%) was added. The mixture was then allowed to stand for 30 min incubation in dark at room temperature. The absorbance was measured by UV-VIS spectrophotometer at 765 nm. The total phenolic content was expressed in terms of Gallic acid. The DPPH radical scavenging activity was carried out according to the method of Raman et al.,.10 1 mL of 0.1 mM DPPH solution in methanol was mixed with 1mL of various concentrations of aqueous extract in methanol (20-120 μg/mL). Mixer of 1mL and 1mL DPPH solutions were used as control. The reaction was carried out in triplicate and the decrease in absorbance was measured at 517 nm after 30 minutes in dark using UV-Vis spectrophotometer. Ascorbic acid was used as reference standard. The inhibition % was calculated using the following formula. The reducing power of tubers of Drynaria quercifolia in aqueous extract was evaluated according to the method of Ravisankar et al.14 Different concentrations of aqueous extract of tubers of D. quercifolia (20–120 μg/mL) were mixed with 1 mL of 0.2 M phosphate buffer (pH 6.6) and 1 mL of 1% K3Fe(CN)6 . This mixture was incubated at 50°C for 20 min. After, 1 mL of 10% TCA was added and centrifuged at 3000 rpm for 10 min. The upper layer of the solution was mixed with 0.5 mL of FeCl3 (0.1%) solution and the absorbance was measured at 700 nm using a spectrophotometer. Ascorbic acid was used as the standard reference. The total antioxidant capacity was measured by spectrophotometeric method of Prieto et al.,.15 At different concentration, aqueous extract of tubers of D. quercifolia (20–120 μg/mL) was combined with 1mL of reagent solution (0.6 M H2SO4, 28 mM sodium phosphate, 4 mM ammonium molybdate). The tubes were incubated at 95°C for 90 min in a water bath. After, the mixture was cooled to room temperature and the absorbance was read at 695 nm. Ascorbic acid was used as the standard reference. The results of dot-blot assay showed coloured spots where the aliquots of aqueous extract of barks of Drynaria quercifolia were placed in row. The purple zone on the plate indicates no (free radical scavenging) antioxidant activity and the yellow zone indicates antioxidant activity. The more intense the yellow colour, the greater the antioxidant activity (Figure 1). The result indicates that the aqueous extract of tubers of D. quercifolia have significant antioxidant activity when compared to standard ascorbic acid. The phenolic and flavonoid compounds quantified in the extracts seemed to be responsible for the antioxidant activity. Phenolic acids, flavonoids are the most commonly found polyphenolic compounds in plant extracts.18 The antioxidant activity of phenolics plays an important role in absorption or neutralization of free radicals.19 Polyphenols also enhance the level of cellular antioxidative system and induce the cytochrome P-450 resulting in detoxifying the activity of carcinogens intracellularly.20 Total phenol content was 4.295±1.23 μg/mL of GAE and flavonoid content was 24.564±0.86 μg/mL of QE in the aqueous extract of tubers of D.quercifolia, as shown in Table 1. 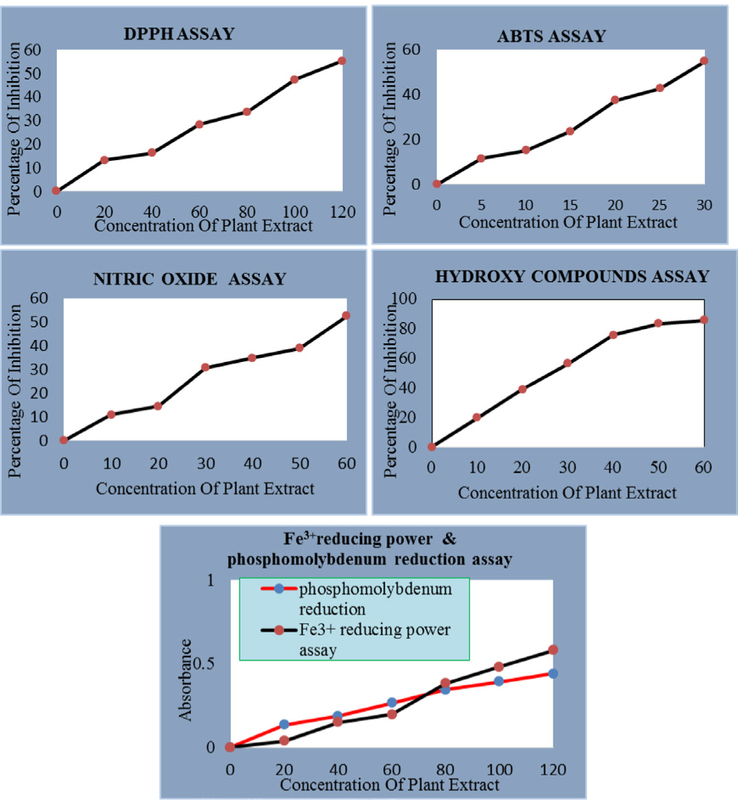 These investigations provide a comprehensive profile of the antioxidant activity of extracts of plants with respect to their phenols and flavonoids content. Dot-blot assay of aqueous extract of D. quercifolia in DPPH Radical scavenging activity. DPPH - 1, 1 Diphenyl-2-picryl hydrazyl STD - Standard (Ascorbic acid). In the total antioxidant activity, ABTS•+ is a blue chromophore produced by the reaction between ABTS and potassium persulfate and in the presence of the plant extract or trolox, preformed cation radical gets reduced and the remaining radical cation concentration after reaction with antioxidant compound was then quantified.22 The maximum percentage of ABTS•+ radical cation scavenging activity was 54.91±5.55% at 30 μg/mL concentration as shown in Table 3 and Figure 2. It was compared with standard (52.41±3.66/30 μg/mL) ascorbic acid. The IC50 of ABTS•+ radical cation scavenging activity was 27.32 μg/mL concentration. Scavenging of hydroxyl radical is an important antioxidant activity because of very high reactivity of the OH radical which enables it to react with a wide range of molecules found in living cells, such as sugars, amino acids, lipids and nucleotides. The hydroxyl radical is an extremely reactive free radical formed in biological systems and has been implicated as a highly damaging species in free radical pathology, capable of damaging almost every molecule found in living cells.23 The maximum percentage of OH• radical scavenging activity was 85.91±5.16% at 60 μg/mL concentration as shown in Table 4 and Figure 2. It was compared with standard (97.67±6.83/60 μg/mL) ascorbic acid. The IC50 of OH• radical scavenging activity was 26.54 μg/mL concentration. In this spectrophotometric method, the absorbance of chromophore formed during the diazotization of the nitrile with sulphanilamide and the subsequent coupling with naphthyethylenediamine dihydrochloride was measured. NO, being a potent pleiotropic mediator in physiological processes and a diffusible free radical in the pathological conditions, reacts with superoxide anion and form a potentially cytotoxic molecule, the peroxynitrite (ONOO).24 Its protonated form, peroxynitrous acid (ONOOH), is a very strong oxidant. The main route of damage is the nitration or hydroxylation of aromatic compounds, particularly tyrosine. Under physiological conditions, peroxynitrite also forms anadduct with carbon dioxide dissolved in body fluid and responsible for oxidative damage of proteins in living systems. The maximum NO• radical scavenging activity was 52.57±3.67% at 60 μg/mL concentration as shown in Table 4 and Figure 2. It was compared with standard (62.85±4.39/60 μg/mL) ascorbic acid. The IC50 of NO• radical scavenging activity was 57.07 μg/mL concentration. The total antioxidant activity of aqueous extract of tubers of D. quercifolia was measured spectrophotometrically by the phophomolybdenum method, which is based on the reduction of Mo (VI) by the petroleum ether fraction and the subsequent formation of green phosphate/Mo (V) complex at acidic pH, with a maximum absorption 695 nm. It evaluates both water-soluble and fat-soluble antioxidants with a high absorbance value of the petroleum ether fraction indicated its strong antioxidant acitivity.26 The maximum absorbance was 0.441±0.030 at 120 μg/mL concentration, as in Table 2 and Figure 2, which was compared with standard (0.359±0.02/120 μg/mL) ascorbic acid. TLC analysis was carried out for aqueous extract of tubers of D. quercifolia by using Hexane:Ethyl acetate (0.2:1.8) solvent system. The separated bands were visualized by UV light at 254 nm. The Rf values of the separated compounds were measured (Figure 3). The replacement of synthetic with natural antioxidants may be advantageous. In the present study, aqueous extract of tubers of D. quercifolia tested with respect to their total phenolic and flavonoid content, antioxidant capacity and oxidative stability. Extractions were performed using the conventional method reflux and methanol as solvent. The existence of phenolic and flavonoid compounds was confirmed by the Folin-Ciocalteu and AlCl3 methods. The antioxidant capacity was measured by DPPH free radical scavenging method was proven to be high. Finally, the results in this study indicate that the examined extract contains significant sources of antioxidants. The aqueous extract of tubers of Drynaria quercifolia was prepared and analyzed for antioxidant activities such as, DPPH•, OH•,NO• radical scavenging assays and Fe3+ reducing power as well as phosphomolybdenum reduction assay methods. The results revealed that the aqueous extract of D. quercifolia showed significant antioxidant activities. The radical scavenging activity was further confirmed by Dot-blot assay method where, the purple colour of DPPH changed to yellow upon reduction. 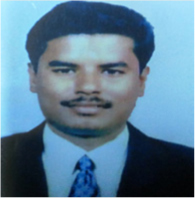 Perumal Arumugam: Director, Armats Biotek Training & Research Institute, Guindy, Chennai-600032. 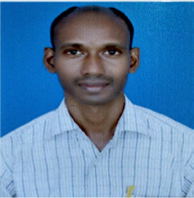 Chandrasekaran Sivaraj: Postdoctoral Fellow, Armats Biotek Training & Research Institute, Guindy, Chennai-600032. We are grateful to the support provided by ARMATS Biotek Training and Research Institute, and Department of Biotechnology, Vel Tech High Tech Dr.Rangarajan Dr.Sakunthala engineering college, Tamil Nadu, India. Conflicts of interest CONFLICT OF INTEREST There is no conflict of interest associated to the work done.